After losing her parents in a horrific terrorist attack on the Twin Towers, fifteen-year-old Honoria and her older brother escape New York City to Arnn. In the lure of that perpetual darkness, Honoria finds hope, when she should be afraid. Perhaps the witch can reunite her with her lost parents. Awakening the witch, however, brings more than salvation from mourning, for Honoria discovers a past of missing children and broken promises. 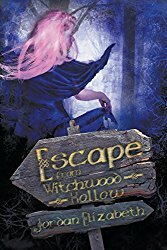 To save the citizens of Arnn from becoming the witch’s next victims, she must find the truth behind the woman’s madness. How deep into Witchwood Hollow does Honoria dare venture?